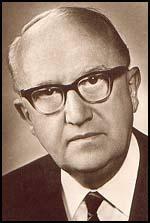 Walter Hallstein was born in Mainz on 17th November, 1901. He studied law in Bonn, Munich and Berlin and graduated in 1925. Hallstein worked for a law firm until 1929 when he became a lecturer in Berlin. 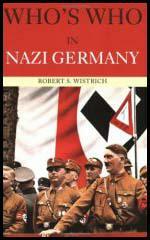 The following year he was appointed as professor of law at the University of Rostock (1930-1941). This was followed by a similar post at the University of Frankfurt (1941-1945). After the Second World War Hallstein taught in the United States at the University of Georgetown. On the 1st January 1958 Hallsein became the first president of the European Commission. In held the post for ten years and during this period he advocated the establishment of the Common Market. Walter Hallstein died on 29th March, 1982. A strange argument indeed. What lies behind the growing interpenetration in the internal market of the Community, which has brought about an increase of 73 per cent in internal trade in four years, an increase of 19 per cent in the gross national product of the Community, and an increase of 29 per cent in industrial production? Does this look like a murderous struggle for position among monopolies? How can this argument be reconciled with the freely expressed aspirations of our European neighbours ... to join the Common Market or to be associated with it in one form or another? The basic meaning of the attacks made against us is that the Soviet leaders have clearly recognised, albeit very late in the day, that something has happened, with unexpected speed and surprising success, which is absolutely impossible according to Marxist-Leninist theory. According to this theory capitalist states cannot overcome their differences and unite; such a union cannot create conditions for long-term economic planning covering large areas and ensuring stability and security in face of crises; these phenomena cannot be the forerunners of an economic system that might one day include the whole free world. All this is impossible, in the Communist mind, not only for theoretical reasons, but for practical ones as well. It is impossible because the Eastern bloc has now reached a state of crisis in its economic evolution which is causing increasing anxiety among Soviet leaders. They are not only concerned with a crisis in the Soviet economy itself . . . they are also concerned, ironically, with a crisis of integration, as shown by the tortured, strained and insipid text of the latest Comecon resolution. What sort of government is the government which we see in embryo in the European Economic Community? It is not, as I said, a further development of normal diplomatic methods of consultation and co-operation as seen in traditional international organisations. Instead, the fusion of interests in the European Community is being achieved through a new mechanism of institutions which it is only a slight exaggeration to call a constitutional framework. Of course, the European Community is not just a new power-bloc or a new coalition, although it has its pride, it is not a swollen version of 19th century nationalism, taking a continent rather than a country as its basis. In fact, it is the concrete embodiment of a new approach to the relations between states. It is not merely international: it is not yet fully federal. But it is an attempt to build on the federal pattern a democratically constituted Europe - what I have called elsewhere a federation in the making.